Background: I’ve been using Debian for the last years on my server. Debian was always easy to upgrade, but there is no option to have ZFS running natively on the server with still out-of-the-box upgrades. Furthermore my services were running in vmware server, a product that was easy to run at the time, but getting IPv6 support correctly working was not my idea of fun. So I looked into FreeBSD and started to get the hang on it’s jails system. Esp. with ZFS. I showed it a friend of mine how easy it is and showed him the installation on my desktop Mac inside virtual machine. I got stuck with selecting ZFS as root filesystem. There was no option for that ! I wondered and found out later, that the option to select ZFS as root was something my hosting service (hetzner) added to their FreeBSD setup routine. 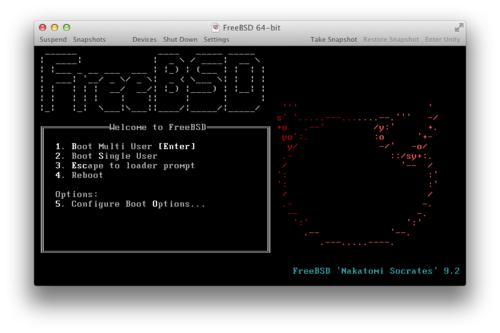 First: Download freebsd disk1 image, boot from that image. Select 2 for single user boot. Setup ZFS. I’m creating a zroot/9.2 for the root directory, so we can have the next FreeBSD version 10.0 as separate zfs dataset later, when that is released. echo 'zfs_load="YES"' >/mnt/boot/loader.conf	# this tells the loader to load the zfs kernel module.